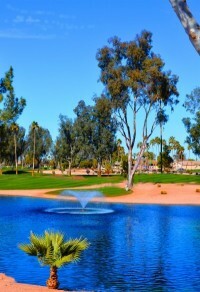 Sun Lakes AZ Golf is one of the many things to do in this Robson developed active adult community. Located less than a half hour from Phoenix Sky Harbor and Mesa Gateway Airports make Sun Lakes a top choice for active adult living in the East Valley of the Phoenix area. Comprised of five separate communities each has their own golf courses and amenities. Let’s take a look at each community and the golf course options. Sun Lakes Country Club is the first community built by Robson that began in the 1970’s. With 2,139 homes you will find a mix of manufactured and single family housing. An 18-hole golf course, pitch and putt course, driving range and putting facility are golfing amenities you will find in Sun Lakes Country Club. This is a completely private course open only for Sun Lakes homeowners and their guests. Beautiful lake and mountain surroundings with plenty of challenge. 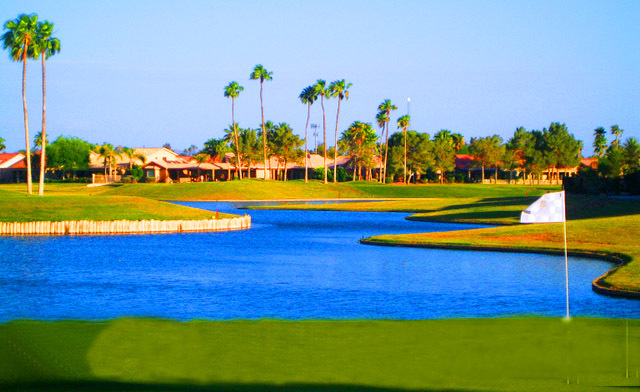 Cottonwood Country Club is the largest of the Sun Lakes communities with 2,736 homes. Single family and villa style homes are available with many lot choices including private, lakefront, golf course and walking path. Cottonwood and Palo Verde share the same homeowner association. An 18 hole Championship Course is also fully private available to Sun Lakes homeowners and their guests. From the black tees the course measures 6,565 yards with a slope of 71.3. Ladies white tees measure 5,764 yards with a rating of 72.8. This is a favorite course by many Sun Lakers with its challenging water holes and well guarded greens. Enjoy a driving range, putting and chipping facility to practice your game. 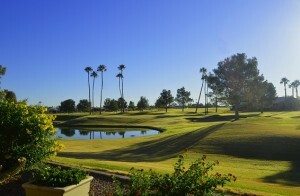 Ironwood Country Club is part of IronOaks – Ironwood and Oakwood Country Clubs and is also gated. It is the smallest of the communities with 734 homes. This 18 hole golf course is 5,163 yards from the championship tees and 3,939 from the forward tees. This community is small enough to get to know your neighbors but large enough to enjoy its own amenities as well as those shared with Oakwood Country Club. A putting facility is available for practice. This course is open to the public but residents can purchase memberships and receive preferred tee times. Oakwood Country Club is the newest of the Sun Lakes communities and the largest with 3,285 homes. 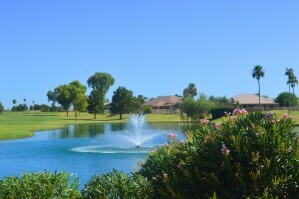 This community features three 9-hole courses with 18 hole rotation on Palms/Sonoran, Sonoran/Lakes and Lakes/Palms. Each 9 hole course measures 3,249 to 3,318 yards from the tournament tees. You will find plenty of challenge on the Lakes course with beautiful water holes. 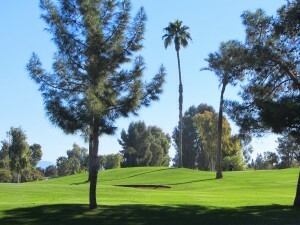 The Palms is more traditional and the Sonoran is a desert course. This course is public but members received preferred tee times.